There is nothing quite like fishing for big freshwater fish, and the white sturgeon, or river or lake sturgeon, is a popular challenge in this field. These monster fish are making a strong comeback after their past overfishing by commercial fishers and will prove to be an excellent choice for your next fishing adventure. Here are some great tips you can use on your next Sturgeon fishing trip. Before we dive into the Sturgeon fishing tips, lets learn a little more about the fish. The white sturgeon is the largest freshwater fish in North America. On rare occasions, sturgeon have been known to grow up to 1.5 thousand pounds and can live more than a century in the right conditions. Sturgeon were once a common sight in the North American Great Lakes region and the upper Mississippi river as well as in Ontario, but widespread commercial fishing in the late nineteenth and early twentieth centuries put their population in a severe decline. However, their numbers have begun to rise thanks to increases in fishing regulations and now the sport is seeing an upsurge in participation and interest. This fish is very unique thanks to its hard armor plated body and its almost "Jurassic" appearance. Indeed, this particular species can trace its evolution back to the Triassic period, making its genetic markers more than 250 million years old. The name "sturgeon" actually refers to more than 25 species of fish in the Acipenseridae family. 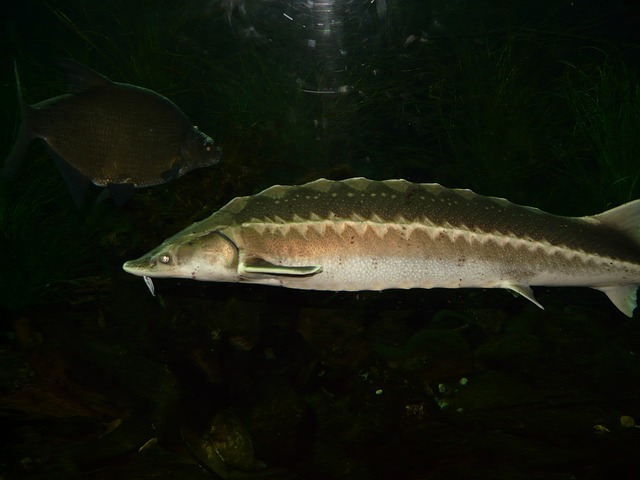 The majority of these species are actually salt water and sea fish that occasionally travel upriver although the freshwater sturgeon found in North America is certainly the most abundant of the different species. 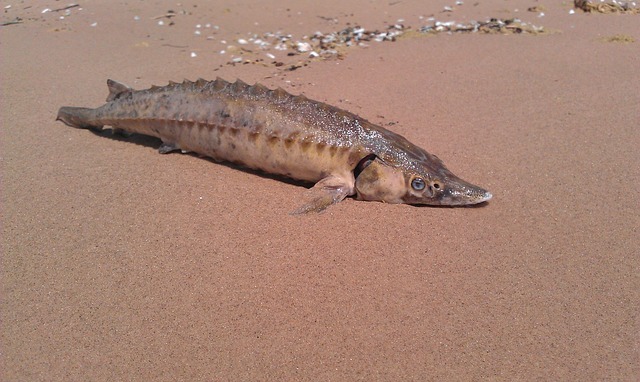 The sturgeon is a highly mobile fish that follow the tides and food on a regular basis. That being said, they are also unpredictable in their movements at times, so logic does not always play a part in determining where they will be. Sturgeon are also considered a bottom feeder species, so they will likely not be easy to see even in the clearest of waters. However, once sturgeon find a place they are comfortable, they are likely to stick around for a while and this is where you will want to set up shop. Like most bottom feeders, sturgeon enjoy living close to the river or lake bottom in comfy little "hidey holes," eddies, current breaks, shelves, or weed edges. Using local fishing reports and/or an electronic fish finder can help you figure out a general area that these big fish might be living in, and from there, it is all about patience. Move slow and make sure that you have the right bait and line, because once you find their hiding places, you are likely to bring in quite a few of these monstrous fish. All that being said, make sure that you are mobile, as well, as there is a good chance that your fish could be on the move. If you find yourself in an area for more than 45 minutes without a catch, then it is time to move on. Unlike many other river and lake fish, you will know if sturgeon are in an area because they are biting and holding anchor in an area that has not shown any results will continue to not show you any results no matter how long you wait. As you might be able to glean from this list, sturgeon primarily like two types of bait: fresh and stinky. It can seem like a waste, but if you have been using some bait for a while without any luck, it is time to toss it, use something fresher, and perhaps move on. And the stinkier the bait the better, as these are fish used to dark conditions and surroundings and tend to feed based on scent more than sight. Minnows are not only great for fishing for Sturgeon but also Steelhead. For fishers near the Bonneville Dam in the spring, it is a common practice to spend the morning catching a great deal of shad or other bait fish to use as bait for their afternoon and evening sturgeon fishing. Depending on where you are going to be fishing, you may be able to employ this technique to save yourself some money on fresh bait. It is also a good idea to take into consideration the season and the area in which you are fishing. Sturgeon, like many fish, are not brainless, and they are more likely to go for bait that matches what they might naturally find in their lake or river home during that particular season. Study up on the area (or areas) that you plan to fish and figure out what the best baits to mimic the natural environment are to ensure your best catch. On the other end of the spectrum, sturgeon hate pike meat, and the use of pike should be avoided to ensure that you can find your sturgeon. If you have caught any pike, refrain from cleaning them near where you plant to fish for your sturgeon, as the smell will easily drive them off. If you are camping, dispose of any fish guts far away from the shoreline so you do not compromise your fishing. As any skilled fisherman can tell you, knowing when to go fishing is just as important as the where. Timing is usually decided by the temperature of the water, and the sturgeon's prime feeding time takes place when the water temperature is running between a mild 50 to 65 degrees Fahrenheit. If you are fishing in the summer or spring, this will likely mean the prime fishing times are in the early mornings or evenings; for winter or fall fishing, depending on where you live, you may need to wait for the sun to come up a bit. Sturgeon can be fished year round, but their most productive months tend to be in the spring when the fish are gathering for spawning season. May, June, October, and November are also known as good months to find the truly monstrous specimens. Another tip is not to be afraid to fish in the rain. Despite their size, sturgeon tend to be light biters and if they sense any resistance in the line, they will drop the bait and flee. In order to ensure a good hooking, it is a good idea to make sure that your rod is lightly tipped to cut down on this resistance and so that when the sturgeon does start nibbling at your bait, you can see the subtle movements in your rod. However, because sturgeon are such big fish and can put up quite a fight, it is also key to have a rod that is sturdy enough to withstand the struggle. Thus, a solid, one piece fiberglass rod between 7 and 9 feet with a thin, sensitive tip and sturdy bottom end are the best choice for sturgeon fishing. It is also wise to invest in some high pound test line to help prevent your line from being snapped by this monster fish. Your rod's reel should be able to withstand at least 80 pounds of pressure with at least 250 yards of length to run. Spinning and baitcasting reels are popular among sturgeon fishers. Spinning reels have the ability to backreel which can help when you are fighting to bring in your catch. Baitcasting reels come equipped with a line out alarm function that can help you better see and feel a bite, no matter how subtle, and are also fitted with the power to better reel in a big catch. It is imperative that your hooks be made of a strong material that is exceptionally sharp so that you have the best chance of hooking a sturgeon and keeping it hooked while fishing. Anodized hooks are an excellent choice because they are super durable and more resistant to wear along the hook's sharp edges. A sharp hook is especially important with sturgeon because their tough skin is difficult to pierce, and a dull or only partially sharp hook is far less likely to be able to set. Determine what weight your sinker should be based on where you are fishing. 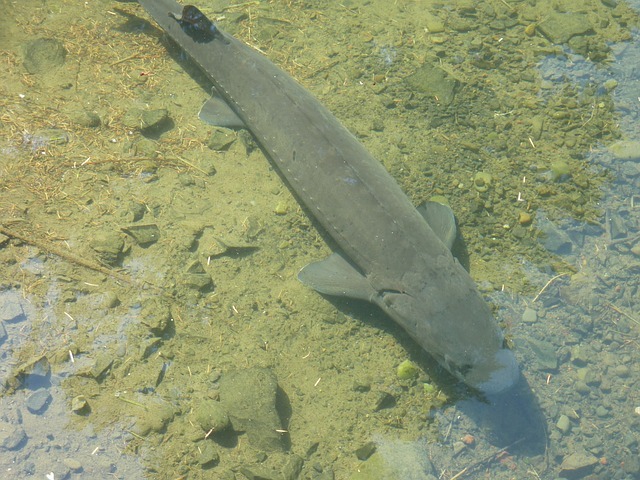 On average, you will want your bait to drag slightly close to the lake or river bed, but if it is too heavy, then the sturgeon will be unlikely to bite. In a quickly moving river, you will want a heavier weight to keep your line steadier; the reverse is true for a lake. Whatever kind of tackle you use, you will want it to be heavier and sturdier to withstand the sturgeon's assault. If you choose to use any spinners or corkies on your leader, then just make sure that they are made of tough stuff. You want your bait to be as close to the bottom as you can without dragging through the dirt and to be heavy enough that it stays generally in one place. While fishing, try slow dragging around deep holes in the lake or river bottom or in swift current areas. If you are fishing at a dam, focus on the tailraces below the dam where there is a current. Sturgeon fishing is very similar to carp and catfish fishing. The major difference is the size of the fish and the amount of fight that you are going to deal with while reeling in your catch. If you are familiar with those styles of fishing, then you have a great place from which to start your sturgeon fishing adventure. Once the fish is drawn to your bait and you feel the line start to move slightly as it takes its first, testing bites, be patient and wait for confirmation that the sturgeon has actually taken a bit enough bite on your hook. Once you are sure, yank back on the pole firmly and start reeling. Make sure that you maintain your stance and move as quickly as possible, because once hooked, this fish will fight hard. For this reason, having heavier, sturdier equipment can go a long way in helping you to land the catch faster. Thanks to the sturgeon's endangered past, there are quite a few regulations that have been placed in recent years on the fish and its capture. Many reservoirs or other parks with lakes are catch and release only or will have stricter than normal rules on how big a fish must be for you to actually take it with you. The sturgeon is an exceptionally slow growing fish and can take a number of years to fully mature. For female sturgeon, 25 years is often the minimum for them to reach sexual maturity, and even then they are only around 55 inches long (which is small for this fish). Males mature slightly more quickly, becoming sexually mature in 15 years, but are even smaller on average during this time (around 45 inches). For this reason in particular, an unbalanced sturgeon population can easily send this fish back into the near extinct state that it was in at the beginning of the twentieth century. For an example of specific state regulations, in the state of Wisconsin, fishers intending on keeping sturgeon must have both a valid state fishing license as well as a harvest tag, which costs around $20 for residents and $50 for nonresidents. In Iowa, lake sturgeon are still classified as an endangered species and therefore cannot be taken from the lake. And in Michigan, sturgeon catching is limited to one fish per angler per year and must be fished from state approved locations. Wherever you choose to go fishing, make sure that you first take a look at that state or region's fishing laws and regulations. While these may seem arbitrary or otherwise troublesome, keep in mind that this amazing, prehistoric fish nearly went extinct and is still struggling to make a comeback. Therefore, it is the responsibility of every angler to do what is right and not compromise a species for a sport. Sturgeon, also known as white, river, or lake sturgeon, is an ancient fish with the ability to grow to vastly gigantic sizes and looks as if it has stepped right out of a book detailing the prehistoric past. This particular fish nearly saw its kind driven out of existence by commercial fishers in North America during the late nineteenth and early twentieth centuries, and is only now starting to make somewhat of a comeback thanks to increased state and regional fishing regulations. When you are ready to take on the challenge of trying to fish up one of these big beasts, make sure that you are well equipped with the gear that you need (such as your handy light tipped, sturdy bottomed fiberglass rod) and the right bait to draw the sturgeon to your sharpened hook.